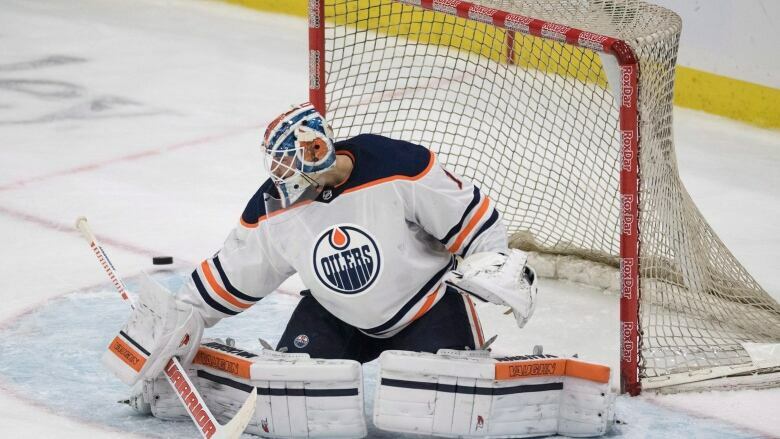 Laurent Brossoit made 30 stops and Connor McDavid scored twice and picked up an assist as the Edmonton Oilers downed the Carolina Hurricanes 4-0 on Wednesday night in NHL pre-season action. Laurent Brossoit and Connor McDavid sent a partisan Edmonton Oilers crowd home happy on Wednesday night in a pre-season NHL game in Saskatoon. McDavid hit his stride in the next period, scoring twice in the final 10 minutes of the game to seal Edmonton's victory. First, he tallied on a short-handed breakaway beating Hurricanes netminder Cam Ward with a low shot to the left corner of the Carolina goal. Shortly after that goal, McDavid scored his second of the contest on an individual effort, coming down the left side of the offensive zone. The Edmonton captain received a number of loud ovations from the crowd, and McDavid was pleased he could give the fans a number of reasons to cheer. "It always nice to see the love for the Oilers," said McDavid. "Anywhere we go in Canada, the fans are so passionate wherever across Canada. "It is special to see the Oiler fans here tonight." Zack Kassian and Milan Lucic scored for Edmonton in the opening 20 minutes. McDavid started a nice tick-tack-toe passing sequence on the power play that resulted in Lucic's goal. Oilers head coach Todd McLellan said McDavid, who is still just 20 years of age, has done lots to deserve accolades from the fans. "He has earned that right," said McLellan. "The people respect him for the player that he is and the performance that he puts on night in and night out. "It would have been easy for him to go through the motions and take the night off, but that is not the type of player here is. Every time he puts the gear on, he wants to lead his team. He wants to get better as a player. "He is a good example for all of our players, and I am sure for a lot of the young players that are in the building here tonight in Saskatoon. He shows up every day to get better." Ward turned away 18 shots in goal for the Hurricanes. The Oilers close out their pre-season schedule on Saturday, when they travel to Vancouver to face the Canucks. The Hurricanes return home to Raleigh, N.C., to host the Washington Captains on Friday to conclude their pre-season slate.